In the Milestones section of the March 4, 2013 issue of Time Magazine there was mention of "Chesty", the U.S. Marine Corps' newest unofficial mascot. This is the fourteenth English bulldog named after the famous Lt. General Lewis "Chesty" Puller (1898-1971). Puller is the most decorated soldier in the history of the Marines. 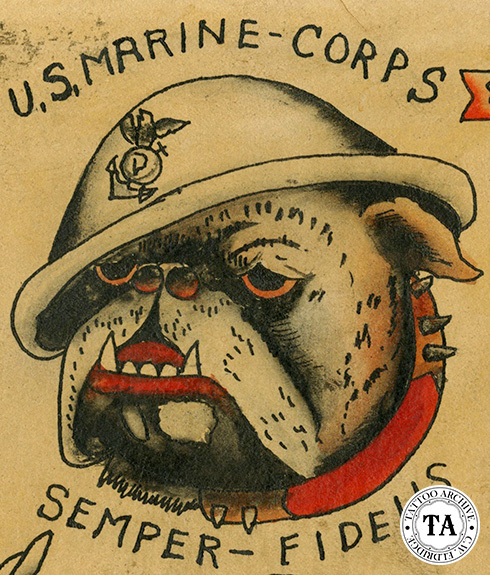 The history of the English Bulldog as a Marine Corp mascot goes back to a 1918 recruiting poster depicting a snarling English Bulldog wearing a Marine Corps helmet. On October 14, 1922 the first unofficial mascot was a registered English Bulldog named King Bulwark. Its name was changed to Jiggs and Marine General Butler enlisted the bulldog into the Marines. The popular folk legend goes that the term Devil Dog came during World War I when members of the German forces would call attacking Marines "teufelshunde" or devil dogs. Teufelshunde were wild and vicious mountain dogs of Bavarian folklore. 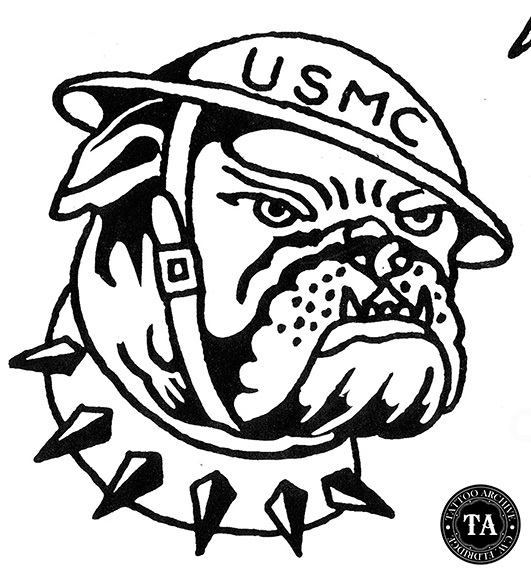 From that day on the bulldog has been associated with the Marines and endless variations of that famed devil dog design has been tattooed on the Marines. Bill Claydon, who currently tattoos in Fayetteville, North Carolina near Fort Brag and has tattooed both Marine and Army personnel on both coasts, stated that while working with his dad Buzz Claydon in Oceanside in the 1960s they had a "Marine Special" for $5.50. It featured a bulldog wearing a Drill Instructor's hat and the lettering USMC under it with just a touch red. 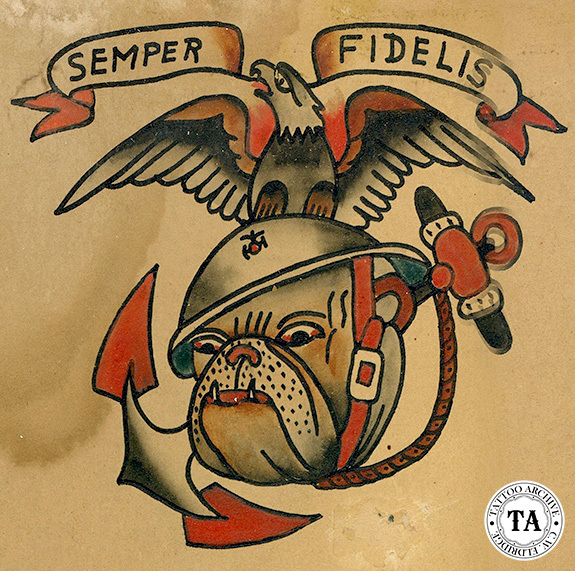 It is probably safe to say that every American and many European tattooists, whether they worked around military bases or not, would have a Marine Corps Bull Dog in their flash collection. Often the design would consist of the classis eagle, globe and anchor with the bulldog head replacing the globe in the design. 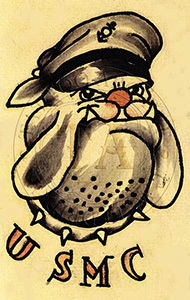 Sometimes the bulldog is shown wearing a Drill Instructor's cover or Officers' Dress Hat, and at times a Garrison Cap or battle helmet. 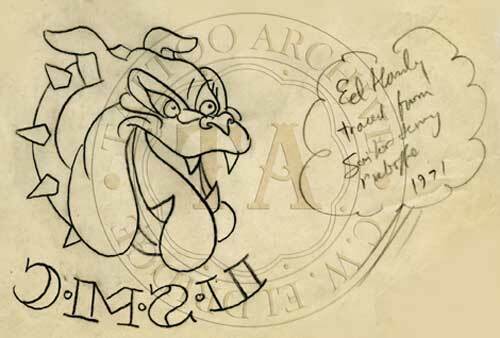 Often the letters USMC or Semper Fidelis are include with the bulldog design, but to us it seems a bit redundant. Nothing says Marine Corps like a snarling bulldog!